well… this is the case not only in your country but in most of the countries actually. women are trying to come up with their craving ideas to explore their talent. its a really good sign of women empowerment ! The NYtimes is the worst, I have noticed their weird apologetic stance on women’s issues for a while, and commented on it elsewhere. Good to have some facts to back up my anecdotal observations. Very interesting study. I love the idea of quantitative analysis of text, for study and writing. i have bookmarked the tutorials from your associate. Took several Data Analysis courses, but was limited to the Enterprise system, with Microsoft BI and SQL Server. Planning on learning more. Thanks for sharing your work with us. As a woman in business, I can appreciate that we only have an almost balanced foot-hold in some areas of some industries. Hmm….Very interesting! 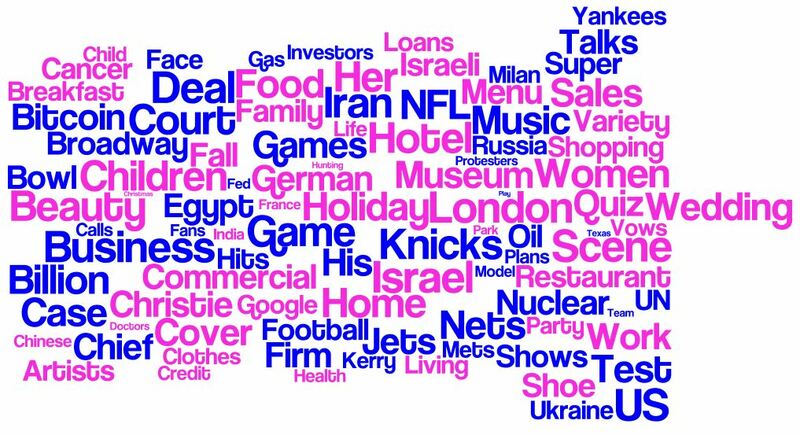 Having been a business journalist for a while, I can’t say that I used the pink words in the cloud more. I guess it boils down to what you are writing on. You should also look at women as sources. The lack of women as e.g. expert sources is a big problem (se I see it) in Danish newsmedia. Gender inequality is a bummer, for sure. Some of the toughest and smartest people I know are ladies. Some of the best writers, too. A very thought provoking study. What is most telling and disturbing is that men are vastly overrepresented in the opinion section. Words associated to female writers were credit and loans, as opposed to deal and investors for the men. An interesting display is the current financial inequality along the gender lines. Thanks for sharing. Thanks for sharing such interesting perspectives. Reblogging this on Southern Mom. Always interesting to see gender studies in new and unexpected ways. The thing is, women write about the things they’re interested in. Men do the same. Once women start getting interested in sports and technology we’ll see this shift. Corporations aren’t interested in discrimination. They’re interested in making good products. And honestly, I wouldn’t be good at writing about sports or technology because I don’t care. I mean, if you go to a party and talk with men and women the topics they talk about will mirror their interests. My female friends don’t discuss technology or programming or stuff like that. The question here is how are we going to get women to be interested in those fields? By giving them the same expectations, the same opportunities. Let them go build weird things with LEGO and let them do weird puzzle games on the computer. Let them fix their own bicycle and have them mow the lawn. Don’t limit them to pink barbies. Though they should certainly be allowed to play with those, too. are you serious? if so, your comment that your …. female friends don’t discuss technology or programming … ” therefore the problem being, ”how are we going to get women to be interested in those fields,” is totally sexist! How are you going to ”get” women to be interested suggests to me some kind of nefarious control of the way women should think …, like, they should think more like men. later you stereotype women by saying they have limited interests namely, ”pink barbies.” it seems to me that your attitude is at the root of the problem of disproportionality. i.e., men in management positions will stifle women’s perceptions because they are not the same as a typical man’s perceptions. these kinds of statements are not fair to women OR men since all men aren’t sexists with the same perceptions as you suggest nor is it fair to suggest that most women not interested in weird puzzle games. if you are serious then it seems to me that you are suggesting further entrenchment into a patriarchal hierarchy which is the root of the problem in the first place. Yeah, okay, so maybe that was not the best written comment in the world. What I mean is that I see boys/men’s interests being cultivated in many different directions. Boys are offered more options than girls as far as I see. How come boys learn to take care of their bikes while girls don’t? I’ve asked my male friends this many times and they just shrug and say their dad taught them. None of my female friends have been taught this. And this is just an example. I’m not saying there’s anything wrong with barbies or pink or dresses. If I could I would wear dresses every day. The problem lies in not giving more opportunities and choices – and studies do show that our options ARE limited. Parents have different ideas of what a girl wants to play with and what a boy wants to play with and their decisions will affect the children. I just think we should all have the option to play with dinosaurs or lego firemen if that’s what we want. Interesting points. What you say about men being afraid of women “usurping” them reminds me of Simone Beauvoir (I think that’s how it’s spelled) who wrote about “what is woman” and pointed out that throughout times man has been defined as the subject and woman as “the other”. Anyway, just thought of it. I agree, changes have been radical. I think that at the point we’re at now we need little insentive to see it all the way through. We don’t need quotas and “special places” at boards. (In many countries they’re making women’s quotas to ensure that women get hired, which I personally think is one of the most discriminating things that has ever happened to me). In the western world the snowball is rolling and growing bigger on its own – women are liberating themselves a bit more every generation. The last bastions are obviously in other countries. It’s fascinating to see India, for instance, and how it’s changing. I guess the front page is based on what people want to read. Sports probably get to the headlines more then topics related to health or family. Is there any research on who actually reads the articles ? To men buy papers more than women? So what is the demographic when it comes to the people who BUY the damn newspaper? 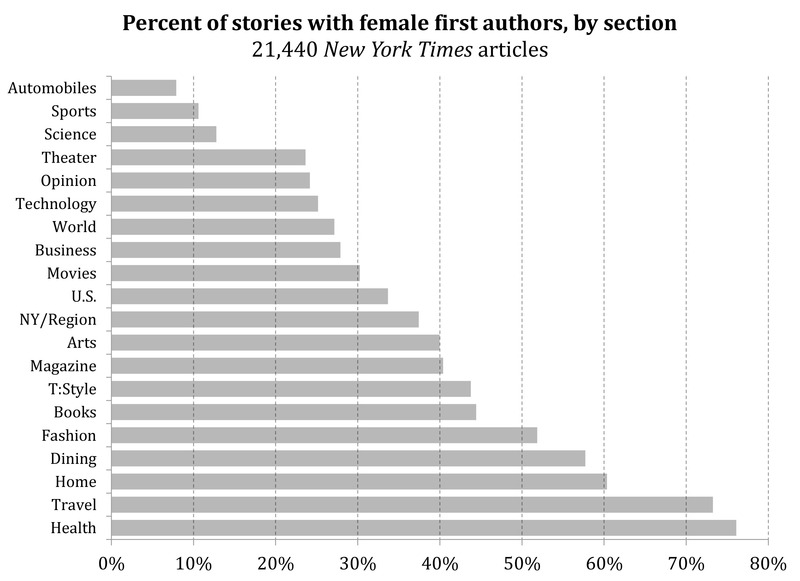 I would imagine more men buy the NYT than women. If that’s the case then a 50/ 50 split of male/female writers would not be ‘equality’ (whatever ‘equality’ is supposed to mean in this context). Also the insinuation (correct me if I’m wrong) is that men typically write for men and are generally biased in the favour of men’s interests… whereas women typically write for women and are generally biased in the favour of women’s interests. But even if that is true, it is always possible (if not certain!) that the women who choose – repeat CHOOSE – to buy the NYT do so because they value the opinions of the writers (and editors) who write for the paper – including all those men with their all their male-influenced biases, slants, attitudes and interests. It is (shock horror!) possible for women to appreciate and value the opinions of men, and for men to value the opinions of women. The sexes are supposed to be *complimentary* …… and they were before feminism started telling everyone we were all at war with each other. If men CHOOSE to buy and read Cosmo or Heat we would probably assume they know what they are doing. We would assume they value the opinions of the various writers and editors of those magazines. Otherwise they would not CHOOSE to buy those magazines, would they? And we would understand that if Cosmo or Heat started filling their magazines full of male writers doing features on motorbikes or football that that would annoy the hell out of the men (and the women) who currently buy those magazines. In society we give men agency to choose things for themselves. We do not try to help to ‘fix’ the world around men based on what WE imagine they want or need. We let men choose for themselves. But the vibe I’m getting from this post is that we can’t expect women to have the agency or the intelligence to actually CHOOSE what to buy and read based on their own preferences… so in the absence of female agency we must do meticulous calculations about words like ‘shoe’ and ‘economy’ to find out if the fragile, helpless, imbecilic women who buy the NYT are actually being force fed too many ‘men’s words’ written by men and not enough ‘women’s words’ written by women. It’s all moot anyway because ‘newspapers’ are dying media anyway. I too was reading the article with interest until I ran into an idea which sent me into a furry of social injustice which disallowed me to continue for a moment more! Women write? Harumph I say! You hear me sir writer of this article! Haaaarumph! In honesty though I was going to make a similar comment to yours but you did so better. While no doubt even in industrialized places sexism exists, professionally I see all the time in areas where men dominate more men apply, where women dominate, well the opposite. And so when we look at the end result instead of the ingredients worked with the cake can seem a lopsided mess with too few eggs and too much flower… that was a bad joke. Assuring equal opportunity is important, but not every instance where the work force is not exactly divided by gender, race, religion and hair color is sexism amiss. Sometimes it’s just a matter of interests. Initially the title “most comprehensive analysis” sounded too bombastic & a claim for bragger rights. But when I read the entire article, the care you have taken in analysing such vast amount of data is apparent. While writing an academic essay on women human rights, I wondered about the psychological angle of why women allow themselves to be dominated at all; but couldn’t find a proper answer. May be writings like yours, throw more light on this. Congratulations on a fine piece of writing. I’m wondering if and how the RATIO of women writers to men writers has been figured into the equation to determine a fair comparison. i.e. the only way to make a fair comparison would be to compare the work of 100 men vs 100 women based on a random sample of authors. naturally, if there are considerably more men than women writers there will be significantly more articles published by men which would lead to totally erroneous conclusions. kind of like using the number of crimes committed as an index of criminality compared to crimes committed per capita.